The concept of a system has always been interesting to me. The term system evokes certain questions. For example, “What is the minimal set of functions for a system to exist?” or, “Can a system be made up of many other systems?” As I see it, the Internet of Things is a system of systems. Each of its three components (the cloud, the aggregator, and the smart sensor) are, in their own rights, systems. Further, any of the two IoT components functioning together without the third can be a complete IoT system. For example, an array of smart sensors communicating with an aggregator can be an optimal system for many applications. At the same time the smart sensor talking directly to the cloud can be an optimal system. The cloud system focuses on performance. Therefore, cost, power dissipation and size are at best secondary concerns. The aggregator system is less concerned on performance and power dissipation and more on flexibility. The smart sensor system focuses on battery life, size and cost, making performance a distant third in priority. 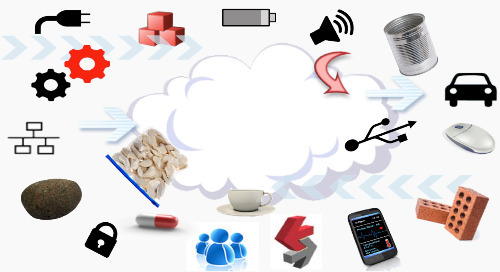 The idea of a smart coffee cup comes to mind to demonstrate how a smart sensor could communicate directly to a cloud. The idea consists of going to my favorite coffee shop and asking for the “infinite” cup of coffee. My reasoning is I will be at the coffee shop working for several hours and don’t want to have to get up every 30 minutes to buy another cup of coffee. With the infinite cup I can sit at my table working while my coffee cup is communicating with the coffee shop’s “cloud”, that is WiFi. When the cloud senses that my cup is getting low, or getting cold, the barista makes me another cup, brings it to me, and charges my credit card. This ends up being a new use for the shop’s existing cloud. It can easily be extended to water glasses in a restaurant and to any menu of drinks I would like during my time in the coffee shop. A micro-vintage wine could be created by placing weather sensors every meter in both the x and y dimensions at a winery. Perhaps groups of sensors would communicate with an aggregator. Finally the aggregators throughout the vineyard would communicate with the winery’s cloud with the mapping of the weather over the whole vineyard. When time to harvest, rather than putting all of the grapes together for one vintage, it is conceivable that one segment of the vineyard had “perfect” weather conditions when compared to the other parts of the vineyard. With this information, a micro-vintage could be created and sold for a premium. When did you first use the cloud? What was your first IoT device? Read part 3 of the series here. Can you guess how much performance gain could be realized by using analog signal processing? How much lower power dissipation? Just how crazy do you think I am?